What is a Market Rate Survey? In November 2014, the newly reauthorized Child Care and Development Block Grant (CCDBG) Act of 2014 was signed into law. This was the first revision to the Child Care and Development Fund (CCDF) Program since 1996. In order to receive CCDF funds, every state must conduct a market rate survey or use an alternative methodology to analyze whether child care subsidies adequately allow child care subsidy recipients equitable choice and access among child care providers. Each state is allowed to decide the design and method of the analysis. Though some states do create and conduct a survey, the market rate analysis in Illinois utilizes the Child Care Resource and Referral (CCR&R) administrative data. The administrative data is collected by local CCR&R agencies and maintained by the Illinois Network of Child Care Resource and Referral Agencies (INCCRRA). INCCRRA's provider database from December 31, 2013 was used for these analyses. The Illinois Department of Human Services (IDHS) assistance rates are based upon the daily full-time price of child care for a given market. Inclusion in the market-rate analysis was limited to licensed providers accepting children on a full-time, part-time or both full-time and part-time basis, those currently providing care, those who provide year round or school year care, those who gave referral information, and those with valid child care rate data. The December 31, 2013 database contained records for 12,202 providers who were listed as both active and licensed to provide care. Of those, 8074 of these providers met all of the criteria for inclusion in the market rate survey sample. Separate samples were drawn from the 8074 providers for providers serving children 6 weeks to 5 years old, providers serving children 6 to 12 years old in before and after school programs, and providers serving children 6 to 12 years old in summer care programs. The sample of providers caring for children 6 weeks to 5 years of age included 6989 providers: 1531 licensed child care center centers, 4985 licensed family child care providers, and 473 licensed group family home providers. The sample of providers caring for children 6 to 12 years old in before and after school programs included 2655 providers: 709 licensed center child care providers, 1736 licensed family child care providers, and 210 licensed group family home providers. The sample of providers caring for children 6 to 12 years old in summer programs included 893 providers: 369 licensed child care center providers, 487 licensed family child care providers, and 37 licensed group family home providers. If a state is to use a market rate analysis to set child care subsidy rates, then the market rate survey must reflect "market realities"; however, additional factors must be considered including fluctuation in prices by age, the categories of child care, and/or other within state geographical variations. Geographic Market: currently there are three geographically-defined subsidy tiers; Group IA, Group IB, and Group II. Age of child: Infants and Toddlers (6 weeks-23 months), Twos (24-35 months), Preschool (36-71 months), and School-age (6-12 years). Type of care: Child Care Centers, Family Home Care Providers, and Family Group Home Providers. Licensing status: Licensed versus non-licensed. In order to ensure that subsidy recipients have equal access to available child care the CCDF recommends that states provide subsidies at the 75th percentile of market rate. This means that within a local community and dependent on age and category of care rate variations, subsidy care recipients would be able to purchase 75 out of 100 available child care slots. In the following tables each cell presents a different child care market as defined by license status, type of care setting, child age, and geographic region. The mean percentile across all counties within a reimbursement group is represented in each cell. The percentiles can range from 0.00, (the current IDHS child care assistance rate for the age group within a reimbursement group can buy no slots outright) to 100.00 (the current IDHS child care assistance rate is more than the price of any available child care slot in the market). Based on these analyses, several generalizations can be made regarding the ability of the Illinois Child Care Assistance Program to cover child care prices within a given market. Almost unilaterally assistance rates do not reach the recommended 75th percentile as recommended by the CCDF. Across all age groups, assistance rates seem to provide better coverage in family child care and family group homes as opposed to centers. Families within the rural Group II region have greater access to available child care slots than those in Group IB, and those in Group IB have greater access than those in Group IA. Finally, assistance rates for school-age children in summer programs fall well short of the recommended 75th percentile, while rates for school-age children in before and after school programs typically tend to exceed the 75th percentile with the exception of licensed family group homes. Child care subsidies were introduced in 1988 as part of welfare reform legislation (in the form of the Family Support Act), employment legislation (in the Job Opportunities and Basic Skills (JOBS) program), and in the Transitional Child Care (TCC) program. Since then, the purchase of publicly funded child care services has been increasingly informed by a market-based perspective, a perspective reflected in and mandated by subsequent Federal legislation. In 1996, the Personal Responsibility and Work Opportunity Reconciliation Act (PRWORA) reformed federal programs that supported families. The Act unified three separate programs that provided assistance to families for child care. Collectively, these programs became the Child Care and Development Block Grant Program (CCDBG). In 2013, a Reauthorization of the 1996 CCDBG was proposed. The bill was signed into law in November 2014. This law was the first revision to the Child Care and Development Fund (CCDF) Program since 1996. The newly reauthorized CCDBG significantly revised many aspects of the CCDF Program for States. Among these revisions included guidance on the way States should promote equitable opportunities for families and providers. CCDGB requires that a State's Lead Agency must conduct either a Market Rate Survey (MRS) or an alternative methodology, such as a cost estimation model. The Illinois Department of Human Services (IDHS) conducts a Market Rate Survey. At the core of the market-based approach to the setting of child care subsidies (child care assistance) are market rate surveys. A market rate survey measures the prices charged by providers and paid by parents in a given child care market. As such, market rate surveys only capture data on the price of child care, not on the cost of child care in a given market. The price of care is the fee per child paid by non-subsidized families for child care services or, when serving a family receiving assistance, the subsidy payment rate plus the family's co-payment. On the other hand, the cost of child care is the actual per-child cost of the program (including personnel, facilities, equipment, and supplies, for example) for providing child care services when all contributions are considered, including free rent, fundraising, or donated services. For a variety of reasons, cost of child care may actually exceed price. Though some states create and conduct a survey, the market rate analysis in Illinois utilizes the Child Care Resource and Referral (CCR&R) administrative data. A market rate survey must, according to the CCDGB, take into consideration variations in market rates of child care services by geographic area, provider type, and age of child. The following child care arrangements constitute the legal child care arrangements in Illinois for which child care assistance can be paid. They include those child care arrangements that are required to be licensed by the Illinois Department of Children and Family Services (IDCFS) and those that are license-exempt. To be licensed by IDCFS, centers and child care homes must meet specified standards regarding physical facilities, caregiver qualifications, and care of children. To receive IDHS child care payments, caregivers (providers) must be 18 or older and have a valid Social Security or FEIN number. Licensed Child Care Center - Care provided in a center-based location licensed by the Office of Licensing, IDCFS. The center may be for-profit or not-for-profit. License-Exempt Child Care Center - Care provided in a center-based location that is exempt from licensing by IDCFS. These include programs operated by public or private elementary school systems, high schools or institutions of higher learning; programs conducted on federal government premises; and other programs recognized or registered with the Illinois State Board of Education, if children in the program are 3 years old or older. Licensed Child Care Home - Care provided in a home licensed by IDCFS where more than 3 and up to 12 unrelated children under the age of 12 may be cared for, including the provider's children. The actual number of children is determined by the ages of the children. The provider may serve the maximum of 12, which includes four school-age children, only if she or he has an assistant. Licensed Group Child Care Home - Care provided in a home licensed by IDCFS where no more than 16 unrelated children under the age of 12 may be cared for, including the provider's children. The actual number of children is determined by the ages of the children. The provider may serve the maximum of 16 only if she or he has an assistant and meets a number of other IDCFS requirements. License-Exempt Child Care Home - Care provided in a home exempt from licensing by IDCFS where no more than three unrelated children or a family of children under the age of 12 may be cared for, including the provider's children. Relative Care - Care provided by a relative, not including the child's parents. In-Home Child Care - Care provided in the home of the child. This report presents information on the market rates providers are charging for providing child care, broken down by several of the factors suggested by CCDF rules (age, categories of care, and within state variations). While the majority of CCDF funds support child care assistance (subsidy) programs, CCDF requirements designate a minimum quality spending requirement. This means that there is a specific amount of federal funds that must be allocated to activities which support the improvement of child care quality. These activities include consumer education, referrals to child care programs, provider training, workforce development supports, and initiatives to improve program quality. During the timeframe of this report, the minimum requirement was four percent (4%). The reauthorized CCDBG requires a progressive increase in this amount from seven percent (7%) in FFY16 to nine percent (9%) in FFY20. In addition to the minimum quality spending requirement, as of FFY17 States are required to spend three percent (3%) of funds for quality activities that relate to improving the quality of care for infants and toddlers. The Illinois Department of Human Services (IDHS) contracts with local child care resource and referral agencies (CCR&Rs) to provide these services to families, child care providers, and other community members. Additionally, the CCR&Rs administer child care subsidies through the Child Care Assistance Program (CCAP), which helps working families of lower income pay for child care. Child Care Resource and Referral services in Illinois are provided by sixteen contracted local agencies, each with a uniquely defined service delivery area (SDA). Each SDA is made up of one or more Illinois counties with a given county wholly contained within an SDA. 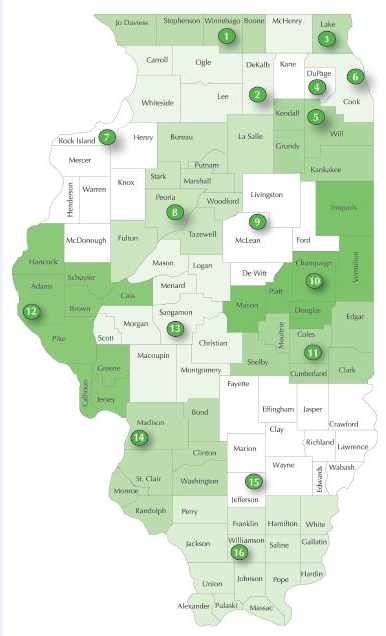 Together, all 16 agencies cover the 102 counties in Illinois (See map in Appendix A). Each CCR&R has one or more physical locations within its SDA; many agencies are housed in larger parent organizations such as colleges/universities, YWCAs, or other community agencies. All Illinois CCR&R agencies are members of the Illinois Network of Child Care Resource and Referral Agencies (INCCRRA) that supports them in their efforts. Staff of each CCR&R use a common database management package, NACCRRAware, to collect and store information on child care providers offering care within the SDA and on parents seeking child care. Information about providers is matched against parents' child care needs to produce a listing of referrals for the parents seeking child care. Each quarter, INCCRRA runs data quality assurance processes on the database, and any identified errors are resolved working with CCR&R staff. A clean data set is then prepared, archived, and used for reporting. For this market rate study, CCR&Rs staff updated provider rate data during the period of October 1 to December 31, 2013. This data set was then compiled by INCCRRA and submitted for this market rate analysis. 1For a discussion of the strengths and weaknesses of the use of CCR&R data for child care market rate studies, see Grobe, D., Weber, R.B., Pratt, C.C., and Emlen, A.C. (2003). Market rate study guidebook: A guide to implementing a child care market rate study using child care resource & referral data. Oregon Child Care Research Partnership. This section includes the analyses for providers of children 62 weeks to 5 years. An additional sample was drawn for providers caring for school-age children ages 6-12 years3. Enrollment (for family child care (FCC)) for at least one age group for their primary shift. Of the 15,509 active providers, license-exempt programs and the providers who were not actively providing care at the time of the market rate survey update were removed from the sample. At this point, 12,202 providers were left in the sample. Of those, 8271 providers were successfully contacted, but 197 did not provide rates. This resulted in a total sample of 8074 for this market rate survey. Table 2 demonstrates the reasons that providers did not provide current rates. 2A licensed provider can only care for a child 6 weeks or older. 3Providers can provide care for either age group or both age groups. The sample for 6 weeks to 5 years and the sample for school-aged children are not mutually exclusive. For the Market Rate Survey, assistance rates are based upon the daily full-time price of child care for the given child care market. As a result, we further selected only those active providers accepting children on a full-time (or both full and part-time) basis and those who provide care during the school-year or year round.4 Additionally, the sample was limited to those providers who gave valid enrollment/capacity data and valid rate information for at least one primary shift so that slot availability could be determined. Finally, the sample was limited to those providers who worked more than 35 hours a week and who indicated that their shift ran four or more days a week. This final sample includes 6989 providers: 1531 child care centers, 4985 family child care providers, and 473 group family child care providers. Mean - the average, calculated by adding all scores in a sample together and dividing by the number of scores. Percentile - in a frequency distribution of numerical scores, the percentile of any specific score x is the percentage of scores out of the total number of scores that fall at or below x in value. For example, the 75th percentile in these analyses is the rate below which 75 percent of rates fall. Median - the 50th percentile, the score that divides the distribution of scores in a sample in half, the score below which and above which 50% of all scores fall. Confidence Interval - the range of values, based on the sample mean, that with a 95% probability, includes the population mean. 4Note: full-time and part time status is provided by NACCRRAware on the shift level. Providers may report up to three shifts (though they may have more). However, complete information is only required on one shift. Therefore, while rates are required for all shifts, capacity is only required for the primary shift. Table 3 represents the market rate sample of the 1531 child care centers broken down by Illinois Child Care Resource and Referral (CCR&R) service delivery areas (SDA) and their capacities. Note: Table represents providers reporting rates for at least one 6 week to 5 years age category for their primary shift. Child care centers are allowed to provide full-time hourly, daily, weekly, and/or monthly rates for the NACCRRAware update. The market rate analysis utilizes full-time daily rates; however, if a full-time daily rate was not provided then weekly rates were divided by the number of days a week a provider provided care, and/or monthly rates were divided by the number of days a month a provider worked, and/or hourly rates were multiplied by the number of hours a provider worked per shift. If a provider gave more than one rate (weekly and monthly) then for the purpose of this analysis, precedence was given first to weekly rates, then to monthly rates, and finally to hourly rates for a consistent measurement of rates. Table 4 represents licensed child care center rates for children 6 weeks to 5 years old for the state of Illinois. Child care centers in Illinois charge on average between $37 and $49 dollars a day for full-time care. Additionally, centers charge more for infants and younger children. Child care markets are defined by specific geographical regions, age group, and type of care (family child care or center child care). Within the state of Illinois, child care markets are broken down into three reimbursement tiers represented by groups of counties with similar populations and makeups. Group IA consists of 7 urban counties: Cook, DeKalb, DuPage, Kane, Kendall, Lake, and McHenry. Families in these counties who are eligible receive the highest child care assistance rates in the state. Group IB is comprised of 16 counties spread throughout the state that have at least one urban area. These counties include: Boone, Champaign, Kankakee, Madison, McLean, Monroe, Ogle, Peoria, Rock Island, Sangamon, St. Clair, Tazewell, Whiteside, Will, Winnebago, and Woodford. Eligible families in these counties receive child care assistance below that of those families in Group IA but above the rates received by families who live in the counties represented by Group II. All other counties in Illinois, which are primarily rural, make up Group II and received the lowest rates of child care assistance (see Appendix B for the Illinois child care assistance payment rates that were in effect at the time survey data was collected). Table 5a and 5b represent full-time daily child care rates for licensed child care centers by county reimbursement group by age. Table 5a provides daily full-time market rates for licensed child care centers by the NACCRRAware age categories for children ages 5 and under. Table 5b provides the daily full-time market rates for licensed child care centers by the current IDHS 6 weeks to 5 year-old payment categories broken down into: 1) infants and toddlers (6 weeks-23 months), 2) two year-olds (24-35 months), and 3) preschoolers (36-71 months). Of the 102 counties in Illinois 86 counties in the database had child care centers that met all the requirements for inclusion in the market rate sample. 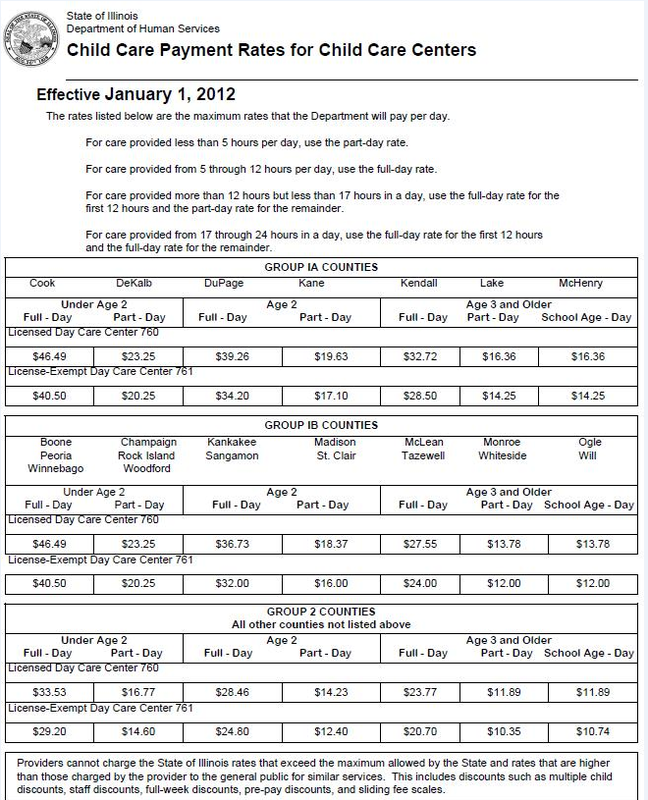 *These Child Care Assistance Program (CCAP) rates went into effect January 1, 2012. 5The 25th percentile is the same as the CCAP maximum reimbursement rate for all age groups in this county group. This is due to clustering of prices at CCAP subsidy levels, which is simply a coincidence due to the data reported. 6The 25th percentile is the same as the CCAP maximum reimbursement rate for all age groups in this county group. This is due to clustering of prices at CCAP subsidy levels, which is simply a coincidence due to the data reported. During the market rate update, child care centers caring for children 6 weeks to 5 years old were asked whether they had any additional fees that they regularly charged parents. Table 6 demonstrates that of the 1531 providers who reported, nearly 30% of all centers charge a registration/application fee and 10% required an additional deposit. The availability of child care during evenings, overnight and on weekends is important as many families have non-traditional work schedules. For the market rate analysis, a provider could be represented by more than one shift if they met all of the inclusion requirements. The market rate sample includes 1,531 providers who offered 1,531 full-time shifts. Only 29 (1.9%) of the 1,531 providers were licensed to provide overnight care. Of the 1,531 full time shifts, 5 shifts were full-time evening shifts and 1 shift was a full-time overnight shift. Only full-time shifts were examined for this analysis. Licensed family child care homes were divided into those providers who had a group home license and those providers who did not have a license to provide group care. Licensed family child care providers may care for up to eight children including their own or up to 12 children with an assistant. This section of the market rate analysis covers the 4985 licensed family child care providers who care for children 6 weeks to 5 years and do not have a group home license. Table 7 depicts this sample of licensed family child care home providers broken down by Child Care Resource and Referral (CCR&R) service delivery areas (SDA). As with licensed child care centers, daily full-time rates for family child care providers were calculated for each of the five NACCRRAware age categories. 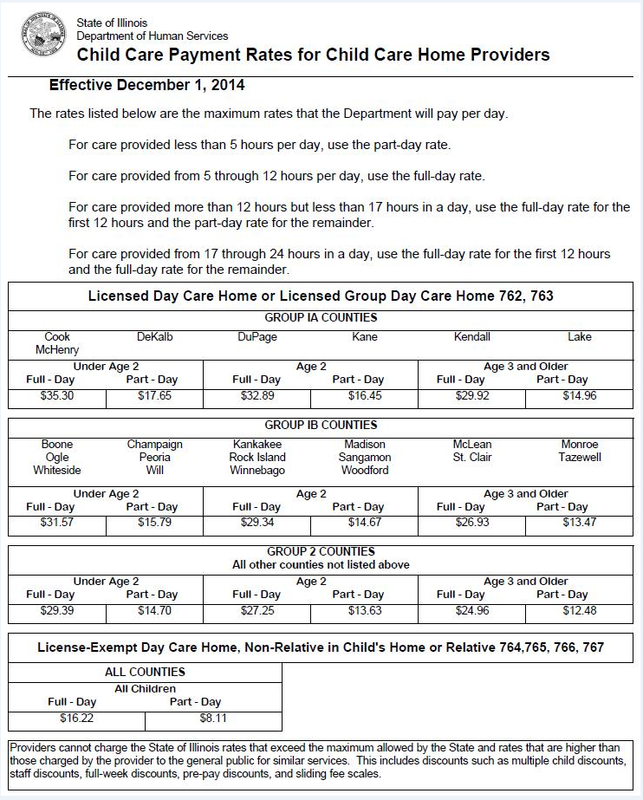 Table 8 presents the daily, full-time rates charged by family child care home providers for the state of Illinois. Family child care provider rates are substantially lower overall than those of child care centers, and the range of available rates is also much smaller. On average, rates range from the high $20s for 5 year olds to the low $30s for infants. Table 9a and 9b represent the daily full-time rates for licensed family child care home providers by county reimbursement group by age. Table 9a utilizes the NACCRRAware age categories for children 5 and under, and Table 9b uses the IDHS 6 weeks to 5 year payment categories. Of the 102 counties in Illinois, 98 are represented in table 9a and 9b. *These Child Care Assistance Program (CCAP) rates went into effect December 1, 2014, 11 to 14 months after the child care rate data were collected. During the market rate update, family child care providers of children 6 weeks to 5 years old were asked whether they had any additional fees that they regularly charged parents. Table 10 demonstrates that out of the 4985 providers in the sample, roughly 11% of all family child care providers charged a registration/application fee and approximately 18% required an additional deposit. The availability of child care during evenings, overnight and on weekends is important as many families have non-traditional work schedules. For the market rate analysis, a provider could be represented by more than one shift if they met all of the inclusion requirements. The market rate sample includes 4,985 providers who offered 5,205 full-time shifts. Approximately one quarter (1,336; 26.8%) of the 4,985 providers were licensed to provide overnight care. Of the 5,205 full-time shifts, 141 shifts were full-time evening shifts and 81 shifts were full-time overnight shifts. Only full-time shifts were examined for this analysis. A family child care provider may be licensed by IDCFS as a group child care home provider if they serve no more than 16 unrelated children under the age of 12. This total must include the provider's own children. The actual number of children allowed is determined by the ages of the children. In order to qualify to serve the maximum of 16 children a caregiver must have an assistant and meet other IDCFS requirements. Table 11 presents the breakdown of the 473 licensed group child care home providers by SDA. 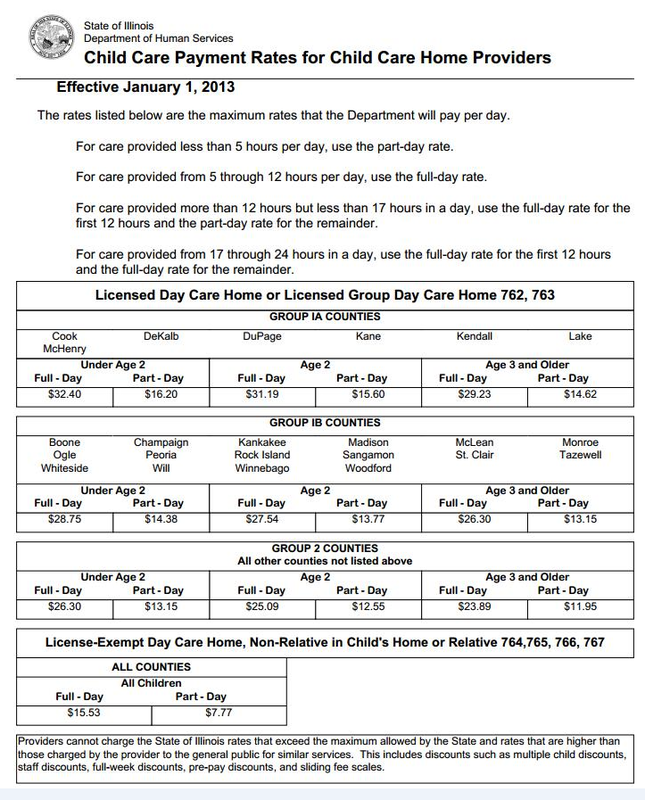 Daily full-time rates for family child care providers with group licenses were calculated for each of the five NACCRRAware age categories as was done with child care centers and family child care providers. Table 12 presents current full-time daily child care rates for licensed family child care group home providers for the state of Illinois. Table 13a and Table 13b present daily, full-time child care rates for licensed family group home providers by county reimbursement group by age. Table 13a breaks down rates utilizing the NACCRRAware age categories for children 5 and under. Table 13b breaks down rates using the IDHS 6 week to 5 years payment categories. For Table 13a and 13b, 60 out of 102 Illinois counties were represented. The licensed family group child care home providers of children 6 weeks to 5 years were asked if they charged additional fees. Table 14 presents the additional fees charged by the 473 providers. Thirteen percent charge a registration fee while 21% require a deposit. The availability of child care during evenings, overnight and on weekends is important as many families have non-traditional work schedules. For the market rate analysis, a provider could be represented by more than one shift if they met all of the inclusion requirements. The market rate sample includes 473 providers who offered 493 full-time shifts with 152 (32.1%) of the 473 providers being licensed to provide overnight care. Of the 493 full-time shifts, 15 shifts were full-time evening shifts and 5 shifts were full-time overnight shifts. Only full-time shifts were examined for this analysis. Providers were selected for the before and after school, school-age children sample if they accepted children before and after school, if they were actively providing care, if they were licensed, and if they accepted children ages 6 years or older. Unlike the sample selection process for child care providers caring for children 6 weeks to 5 years, selection of before and after school providers caring for children 6 years and older was not dependent on whether the provider accepted children on a full-time or part-time basis. Providers were excluded from the sample if they were not accepting referrals, if they did not provide data for before and after school programs, if they did not report license capacity (for child care centers) or enrollment (for family child care homes), and if they only offered summer programs. As a result of these selection criteria, the total sample of before and after school programs for school-age children was 2655 licensed providers. Of these, 709 were centers, 1736 were family child care homes, and 210 were group homes. Tables 15, 16, and 17 show the breakdown of these providers who accept school-age children before and after school, by SDA. Table 15 presents the results for licensed child care centers, Table 16 presents the results for licensed family child care home providers, and Table 17 presents the results for licensed child care group homes. Note: Table rows are hidden for SDAs that do not have more than one provider in the sample, but the statewide total row and column percentages are calculated based on the full sample of 715 licensed child care centers with before and after school care. Note: Table rows are hidden for SDAs that do not have more than one provider in the sample, but the statewide total row and column percentages are calculated based on the full sample of 210 licensed group child care home providers with before and after school care. Table 18 displays the rates for school-age children in child care centers, in family child care homes, and in group child care homes. These rates were calculated in an identical fashion to those rates for children 6 weeks to 5 years old. Tables 19, 20, and 21 display the full-time daily rates by county reimbursement group for each of the three samples who offer before and after school care for school-age children: child care centers, family child care home providers, and group child care homes. *These Child Care Assistance (CCAP) rates went into effect January 1, 2012. Licensed child care centers, family home care providers, and family group home providers reported charging additional fees for school-age children. Table 22, 23, and 24 display these charges. Table 22 shows the additional fees charged by the 709 sampled child care centers. Table 23 displays fees charged by 1736 family child care providers in the sample. Table 24 illustrates the additional fees charged by 210 sampled group family child care providers. Child care centers are more likely to charge a registration/application fee (78%), whereas only 14% of family child care providers and 23% of group family child care providers charge an additional fee for registration. For the market rate survey analysis, a provider could be represented by more than one shift if the inclusion criteria for before and after school programs were met. Of the 709 centers, 15 providers (2.1%) held a license for overnight care. Of the 734 shifts provided by the 709 centers, 3 (0.41%) were evening or overnight shifts. Family care providers were more likely to offer non-standard hours for school-aged children than centers. 595 providers (34.3%) were licensed to provide overnight care. Of the 1,802 shifts provided by the 1,736 family child care home providers, 69 shifts were during nonstandard hours (53 evening shifts, 16 overnight shifts). Of the 210 group child care home providers, 94 (44.8%) providers were licensed for overnight care. Of the 217 shifts provided by the 210 group child care home providers, 7 (3.2%) shifts offered care during non-standard hours. When school is not in session over the summer months, many school-age children are cared for in full-time summer child care programs provided by centers, family child care providers, and/or group home providers. The sample selection process for the full-time school-age summer programs was nearly identical to that of the 6 weeks to 5 years of age sample, but this sample included providers who provided care only during the summer or year round (including the summer). The sample selection process resulted in a sample of 893 licensed providers. Of these providers, 369 were child care center providers, 487 were licensed family child care providers, and 37 were group child care home providers. Tables 25, 26, and 27 present the breakdown by SDA of providers in the market rate sample who offer full-time summer programs for school-age children. Note: Table rows are hidden for SDAs that do not have more than one provider in the sample, but the statewide total row and column percentages are calculated based on the full sample of 369 child care centers. Note: Table rows are hidden for SDAs that do not have more than one provider in the sample, but the statewide total row and column percentages are calculated based on the full sample of 487 family child care homes. Note: Table rows are hidden for SDAs that do not have more than one provider in the sample, but the statewide total row and column percentages are calculated based on the full sample of 37 group family child care homes. The rates for full-time daily licensed summer programs for school-age children were calculated in the same manner as those rates for licensed providers of children 6 weeks to 5 years old. Table 28 displays the daily full-time child care rates for summer programs for children 6 to 12 years of age for the entire state of Illinois. Tables 29, 30, and 31 display the full-time daily rates broken down by county reimbursement group for child care centers, family home care providers, and group child care home providers who offer full-time summer programs for school-age children. The additional fees charged by the child care center, family home, and group home providers providing full-time summer care for 6- to 12-year-olds are presented in Tables 32, 33, and 34. Table 32 shows the additional fees charged by the 369 child care centers used in this sample. Table 33 displays the extra fees charged by 487 sampled licensed family child care providers. Table 34 provides the distribution of the 37 group family child care homes in the sample that charge additional fees to parents. Those providers who offered full-time care for school-age children during the summer did not offer very many non-standard shifts. The 369 child care center providers offered 371 shifts of which 2 (0.54%) were non-standard (0 overnight shifts and 2 evening shifts). 14 (3.8%) of these providers had a license to provide care for children overnight. Family care providers appear to be more likely to offer non-standard shifts than centers. Of the 487 family care providers, there were 515 shifts offered with 8 (1.6%) evening shifts and 20 (3.9%) overnight shifts. 151 (31.0%) family care providers had a license to provide overnight care. For family group home providers, there were 38 shifts for the 37 providers. Of these 38 shifts, 1 (2.6%) was an evening shift and none were overnight shifts. In total, 11 (29.7%) of the group home providers possessed a license to provide overnight care. One of the main functions of the Market Rate Survey is to analyze child care assistance rates (subsidized child care rates) to the market rates for the state of Illinois. States are encouraged to explore geographic breakdown of the child care market. In the state of Illinois the child care market is geographically separated into three reimbursement tiers represented by groups of counties. Group 1A includes the urban counties of Cook, DeKalb, DuPage, Kane, Kendall, Lake and McHenry. The eligible families in these counties receive the highest assistance rates in the state. Group 1B includes: Boone, Champaign, Kankakee, Madison, McLean, Monroe, Ogle, Peoria, Rock Island, Sangamon, St. Clair, Tazewell, Whiteside, Will, Winnebago, and Woodford counties. Families who live in a group IB county receive the next highest level of child care assistance. The final reimbursement tier, Group II includes all other counties in the state of Illinois. Families in this reimbursement tier receive the lowest rates of child care assistance. Tables 35 through 43 display the maximum CCAP payment for child care centers, family home providers and family group home providers, before and after school providers (CCC, FCC, and group homes), and summer programs (CCC, FCC, group homes). The tables are broken down by county, by age of care group. For each segment, the total license capacity, and the 25th, median, and 75th percentiles of the market rate are presented. The final column within these tables is the CCAP percentile. This column displays the percentile of available slots the maximum CCAP payment will cover, i.e., the percentage of rates in a given market that fall at or below the CCAP minimum rate. For example, a CCAP percentile of 75 means that the CCAP subsidy will allow a parent/guardian to choose from and purchase a child care slot from 75% of the available child care slots on the market. A 100.00 CCAP percentile means that using the CCAP subsidy, a parent/guardian can purchase any slot in the market. A CCAP percentile of 0.00 means that using the CCAP subsidy a parent will not be able to purchase any slots within a given market. Please note that the samples in this section are varied due to missing provider data. Additionally, if there were less than 2 providers or less than 3 slots in a county for the type of care or age group, the data is not shown. Note: A given county may not be represented in the table because rates were not available in the INCCRRA database for that county or no provider from that county met the criteria for inclusion in the sample. Data are not displayed if rates are based upon fewer than 3 slots. This appendix includes the CCAP rate charts that were used in the analysis for this report, as well as the rate charts that were effective during the time period when the data were collected. The CCAP rates used for the child care center analysis were effective July 1, 2014 (Figure 1). The rates used for the family child care and group family child care analysis were effective December 1, 2014 (Figure 2). The CCAP rates that were in effect during the time period when the data were collected (October-December 2013) were effective January 1, 2012 for child care centers (Figure 3) and January 1, 2013 for family child care and group family child care homes (Figure 4). Please note that CCAP rates for child care centers remained the same (Figures 1 and 3). The following tables include data collected from those child care providers who are license-exempt and chose to be listed in their local CCR&R referral database. This is only a sample of the license-exempt providers in the state of Illinois and the extent to which these providers represent the population of license-exempt providers is not clear. Table 1 presents rates for children 3 to 5 years of age for child care centers. Table 2 presents rates for children 6 weeks to 5 years of age in family child care homes. 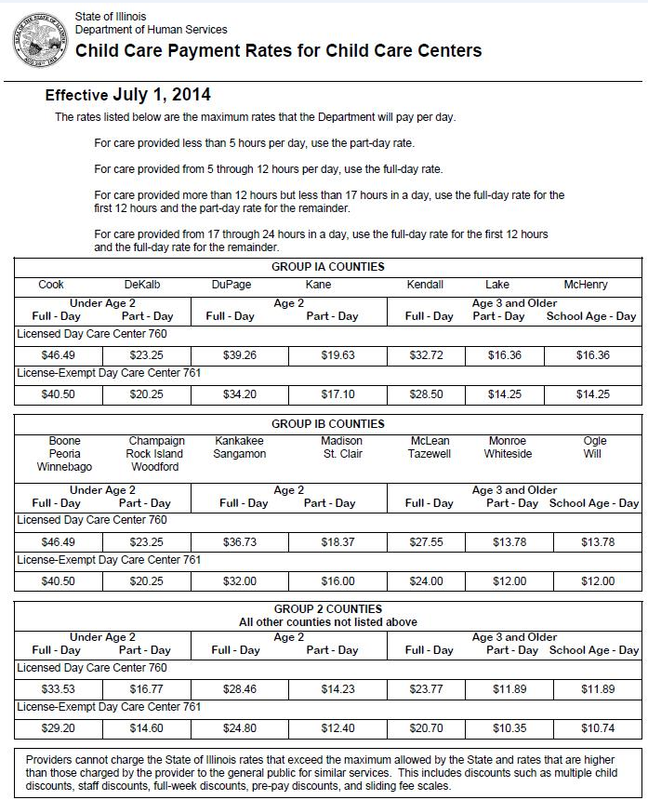 Table 3 presents rates for children 6 to 12 years of age in child care center summer programs. Too little data existed to create tables for children ages 6-12 years in before/after school programs (both centers and family child care homes), and for school-age children in summer care in family child care homes. Note: A given SDA may not be represented in the table because rates were not available in the INCCRRA database for that SDA or no provider from that SDA met the criteria for inclusion in the sample. Rate data are not displayed if fewer than 2 providers were represented or there were less than 3 slots. The rates presented in this report are a function not only of the rate charged by each provider for a particular age group but also a function of the number of child care spaces or slots available for that age group for all providers serving that age group within a particular market. Thus, the mean rate is a weighted mean, with each provider's rate for a given age group weighted by the licensed capacity for children of that age group. Percentiles moreover, are based upon weighting a given rate by the number of slots available at that rate, for a given age group, within a given payment region and then ordering the rates from lowest to highest. By way of example, suppose there are two providers of infant care in a given region. One, Provider A, charges $10.00 per day and the other, Provider B, $20.00 per day. The simple mean of the two rates is $15.00 (($10.00 + $20.00) / 2 (providers)). However, Provider A has a capacity of 10 slots for infants whereas Provider B has a capacity of 20 slots. The weighted mean of the rates is $16.67 (($10.00 x 10 + $20.00 x 20) / 30 (slots)) reflecting the relative greater availability of rates at the higher $20.00 price. Likewise, a given percentile may also differ dramatically depending on whether it is calculated by provider or by slot. Suppose this time there are four providers of infant care. Provider A charges $10.00 per day, Provider B $20.00 per day, Provider C $30.00 per day, and Provider D $40.00 per day. Let's say we wish to determine the 75th percentile and do so based on a per-provider basis. Determined in this manner, the 75th percentile is $30.00. On the other hand, if we choose to identify the 75th percentile considering the number of available slots for each rate, we may come to a different result. Suppose Provider A has one slot, Provider B two slots, Provider C three slots, and Provider D six slots. If you were to line up the rates of those 12 slots from lowest to highest and select that rates that determine where 75% of rates fall below, you would find that $40.00 represents the 75th percentile.